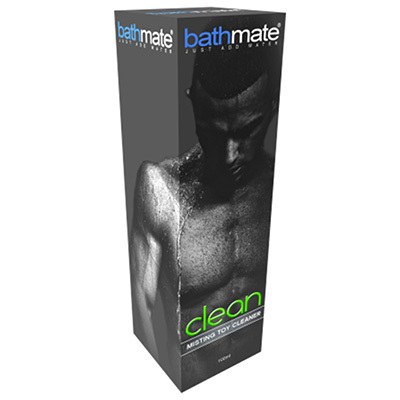 The Bathmate Clean Misting Spray is an alcohol free spray designed to keep adult product clean from bacteria after use. Not only does it work on the Bathmate range, but can be used across all adult toys. The Bathmate Clean Misting Spray is completely safe to use on latex, silicone, rubber and other quality materials used in adult products. The spray also has a mild lemon scent for an extra freshness spell. To use simply spray onto the surface of the piece. Once completely covered wipe with a clean cloth and then run under warm running water. Then leave the toy to dry completely before storing in a cool dry location out of direct sunlight. With the Bathmate Clean Misting Spray you can ensure your favourite pieces are hygienically clean for next use, and safe from damage caused by excessive contaminates left on the outer surface. We would not recommend this spray for use on leather. Latex, rubber & silicone friendly.